Cabinet - Waypoint livingspaces, refinished by us in a Gentelman's grey paint color from Benjamin Moore. where did you get the vanity? - I know it’s a custom paint job. I’m having a hard time finding a powder room vanity that I can paint. I love the style of this one. Thanks! Nice design - what did you do for the floor? 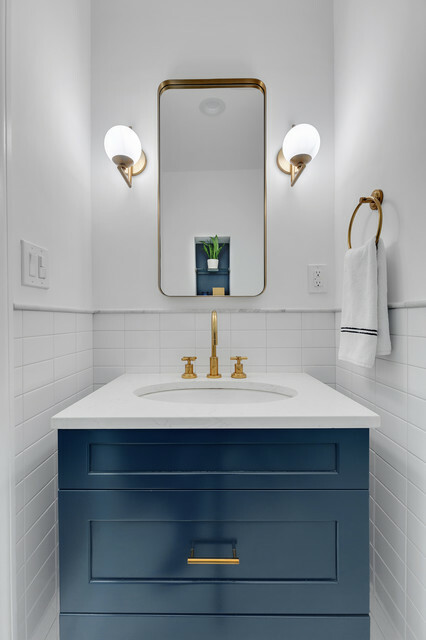 I would love to know where the mirror and sconces are from, thanks! HI Beverly! This is a bristol wall mirror in an aged brass finish from Restoration Hardware. These mirrors come in a number of different dimensions - you can find more info here. The wall sconces are called Mod Globe Linear Sconce in an antique brass finish. There are a number of different vendors that sell these - for this particular project, we procured these sconces from a local lighting vendor that we have a trade account with. Hope this is helpful but please do not hesitate to reach out if there is anything else we can assist with. what color blue is the base of the vanity? Hi Sean, this color is called "Gentleman's Gray" from Benjamin Moore. Hope this is helpful but please do not hesitate to reach out if you have any other questions. Kids bath: I like the round pendants here and the contrast of the bright blue with white. Don't love size of this mirror. Prefer bigger. I like this vanity, but I need a bigger mirror and change the light fixtures.